Summer desserts at our house usually center around seasonable fresh fruit, usually prepared very simply. Sometimes I grill peaches or apricots, pair berries with sorbet or serve slices of fragrant melon with large-flaked sea salt. The past few weeks, I have been disappointed not to find any fresh figs, one of my favorite summer fruits, anywhere in stores or local markets. Finally, I found some at Whole Foods, perfectly ripe, and so tempting that I ate two while driving home from the store. I knew exactly how I wanted to prepare them, inspired by a sampling I’d seen – and tasted – at our local Trader Joe’s. They had served pieces of fresh fig with a dab of mascarpone cheese and a drizzle of honey, perfection in a bite. LtC TIP: Warm the honey slightly for easy drizzling. 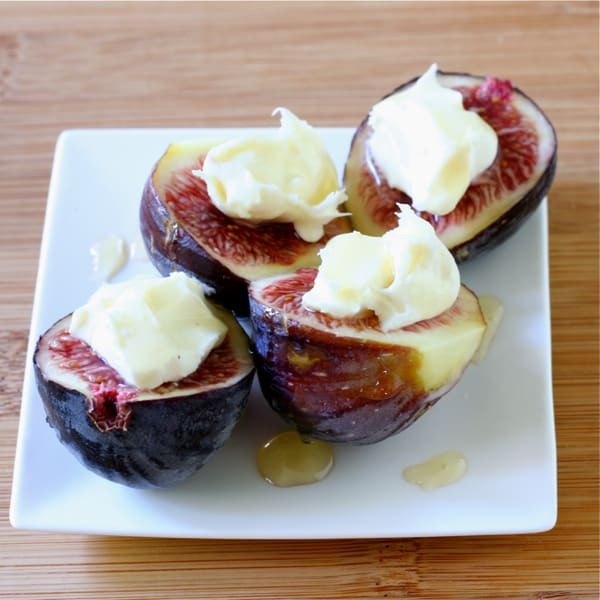 A summer dessert celebrating fresh figs. Wash and halve the figs. Arrange 3 figs on 2 dessert plates. Spoon some mascarpone on each serving, drizzle with honey and serve. So delightful Liz! We are in a fig drought here as well and I can’t wait…I have a tree and all my fruit dropped prematurely..I have two flats on order. I hope you get your hands on some figs soon, Wendy – wonder what’s going on? How nice of you to make dessert for me and my hubby on our anniversary! I love the simplicity of this – just let the ingredients shine! Happy Anniversary to you both – I enjoyed your photos on Facebook. I love fruit and cheese together and love the idea of adding honey for sweetness. What a lovely way to use local fruit! Talk about simple – my kind of summer dessert, Lisa. Such a perfect treat, I love figs and have not seen them at all in the stores. They are one of my favorite late summer fruits. We generally start seeing them around now and not a fig to be found. This is so simple and delicious, I love the dollop of mascarpone and drizzle of honey.